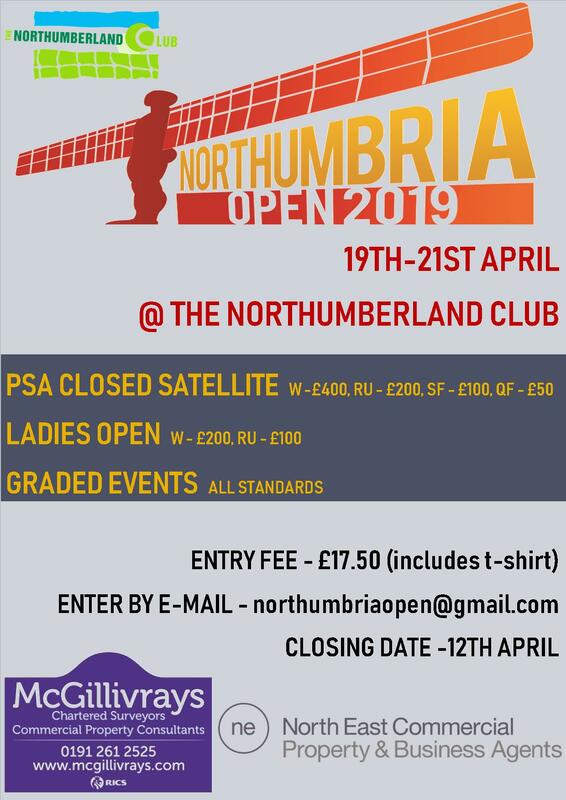 Coming off the back of another successful season in the JICC (GU17 finishing in 2nd and BU17 finishing 3rd) Northumbria entered a team at all age groups in both the boys and girls events. 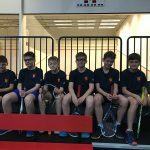 Several significant changes were put in place after a thorough review of the JICC by England Squash so managers, parents and players were hopeful of a junior experience to remember. One of the main changes involved the structure of the competition, now condensed into two stages and with Stage 1 (North) being held across three venues in Manchester. 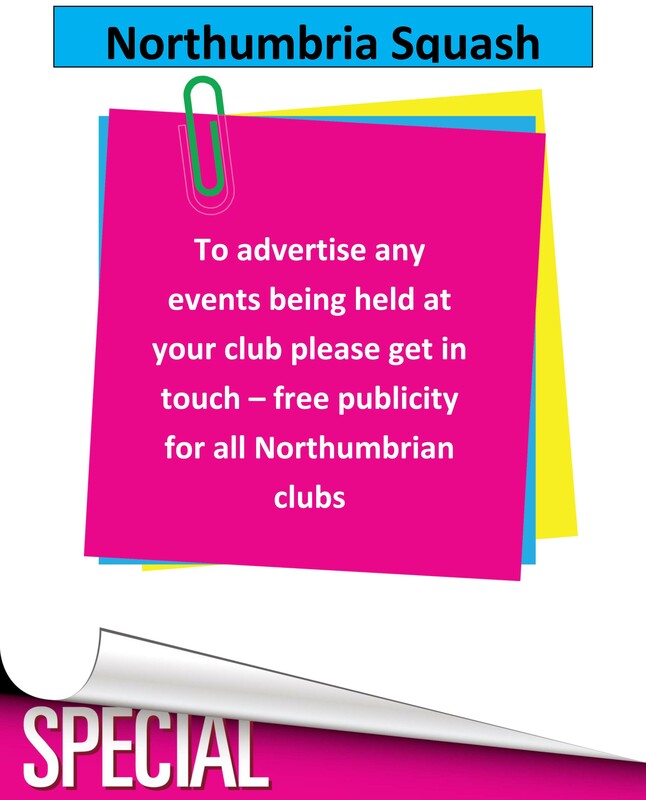 Unfortunately the hope of a smooth event disappeared with a breakdown in communication from the organisers who made several last minute changes causing headaches and dismay across players, parents and managers. Our teams on the other hand, as always, didn’t disappoint. Thanks to all the players who represented us in Stage 1, you all played with exemplary attitudes and gave some fine performances. Huge thanks to the team captains and parents who supported, it’s a team effort and we couldn’t do it without your help and support. Poor communication and last minute changes from ES aside it was a great weekend. It’s awesome to see our juniors pull on Northumbria t-shirts with such pride and passion and it’s a privilege to be a part of their journey through the sport. Finally thanks to all the hard work from the coaches and clubs who support and encourage our young players on a weekly basis. For a small county we are in a good place and long may it continue! 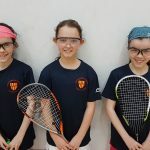 The GU11 team, managed by Richard Naisbitt, featured exciting twins Kate and Ava Naisbitt, who now seem like veterans of the junior scene despite being so young and Sophie Johnson who was making her debut. A confidence building first win for debutante Sophie and a close victory for Ava gave Northumbria a win against Yorkshire. Beating our giant Northern neighbour is always something to savour, what a great way to start the weekend. 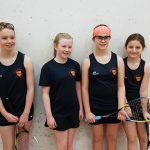 After this none of the girls lost a match notching up wins against a weaker Lincolnshire and a strong Warwickshire (Kate going all the way to 15-13 in the final game, we can only imagine how her mum and dad felt). 1st place and through to the main finals, a fantastic achievement already for the girls! 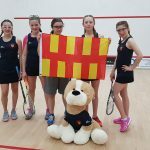 Managed by Angie Paterson Northumbria’s GU13 team included Zoe Shipsey and Sian Tuck along with Holly Burdon and Shae Paterson. 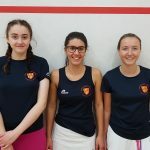 A special mention must go to Grace Moore who was selected for the team before England Squash changed the team size from five to three players in the lead up to the event… First up was a match against Cheshire with Sian and Shae securing early and convincing wins. Zoe brought home full points after Cheshire’s no 1 made things difficult for her with ‘old man squash,’ suiting the freezing cold venue. One more match in the afternoon was needed to send Northumbria through to the main finals and the girls didn’t disappoint. Holly seamlessly stepped in at no 3 winning quickly with Shae and Zoe wrapping up their matches without dropping a game. Well done girls! 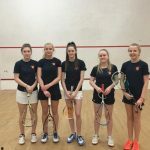 Northumbria Leagues stalwart Paul Satow looked after a lively and young GU15 team made up of Annabelle Satow, vastly improving Mia Smith and Millie Evans, Libby Foster and Evie Paterson. The team’s no 1, Emily King, missed out after breaking her toe on a trampoline in the week leading up to the event. After being asked what she was doing on the trampoline she replied, ‘bouncing up and down!’ Duuuuhhhhhh. It was soon apparent that it was going to be a really tough group with four other very strong teams involved. Tough losses against Yorkshire and Warwickshire were great experiences for the girls followed by a more tightly contested match against Worcestershire (Evie getting a win) and finally a win against Leicestershire. The girls through themselves into the day with face paint and a giant mascot, brilliant to see them so proud to represent Northumbria. Our GU17 team have had success throughout the age groups as they’ve grown up, it’s a talented group of players who really gel well as a team. Managed this season by Marianne Anderson the team consisted of Beth Tudor, Katie Barker and Beth Dean, Lucy Anderson and Harriet Wight. Only two other Northern teams entered the competition meaning two matches with best of five scoring at the cold Sugsden Sports Centre. Yorkshire were the first opponents and despite the girls putting in some good performances the odds were severely stacked against them, going down 5-0. Lancashire were next, the winner taking home a place in the Trophy finals. This one went down to the wire with the lower order coming through with wins for Beth Tudor, Katie Barker and a super tight 3-2 victory for Beth Dean. Well done girls, another final in another season! I’ve recently started a new hobby in climbing. Little did I know it would come into practice after only a month at Sugsden Sports Centre, where quite a few of our teams were based. Spectating wasn’t ideal to say the least but Captain Marianne got a picture of how I used my new skill set. After a last minute change in age eligibility the team’s number 2 Dan Toole was no longer able to represent the BU11 team, infuriating for both Dan and myself. This meant that skilful Ethan Brown headed the team followed by Sam Tufton, Leo Blackett and Aidan Mahoney. Kevan Mahoney looked after the team and was as cool as a cucumber as they started the first match against Worcestershire. The same can’t be said for Claire and Liz who felt physically sick before a single ball had been hit! Despite their mum’s worries Leo and Sam both looked unfazed on their debuts winning 3-0. Ethan was against England no 9 Oliver Beard, who just seemed to have an answer for everything, we all know how that feels! In the final match the team faced Lincolnshire and it promised to be a cracker. Aidan, also on his debut got the team off to a great start and Ethan came so close to sealing a place in the final unfortunately losing out to the England no 19 3-2. Sam found the going tough in the decider against the England no 38 losing 3-0. A great day with so many first caps and a place in the Trophy finals awaits in Stage 2. Again the last minute change in age eligibility saw Northern’s quickly improving Joe Elliott miss out on a well-deserved cap at U13 level. In his absence the team included Sam Ponente, Ben King, Ben Tudor, Matthew Mahoney, Angus Dean and Tom Watts. Another Northumbria League stalwart Charlie Ponente captained the team and offered timely advice from his years of experience duelling it out with the County’s finest senior players. Wins against Cheshire and North-Wales made a place in the Trophy finals certain but a whitewash loss against a very strong Warwickshire wasn’t a surprise, with four of their players in the top 20 in England. It was a great day for the team who like all the teams finally got to play alongside each other instead of against each other. A match on the all glass court at the squash centre was a memorable experience, well done boys, another Trophy final for Northumbria. 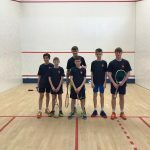 Also playing at the National Squash Centre the BU15 team integrated players from a wide range of clubs, captained by squash guru Paul Taylor for the second season running. Tynemouth’s wizard Tom Walsh lead the team from string 1 followed by hard-hitter and now giant Sam Sweeney, Milan Stach, James Taylor, Will Johnson and Luke Radley. A group featuring Yorkshire, Warwickshire and Merseyside was always going to be difficult but the team performed brilliantly all day. Losses down the order against Yorkshire were inevitable but there were strong performances from Sam and Tom. Sam forced a decider with the England no 53 and Tom beat England no 25 Josh Payne in straight games. A 5-0 whitewash against Merseyside followed, again Tom getting another scalp in England no 17 Corey Harding. A win versus Warwickshire would book a place into the Trophy finals and I arrived at the squash club in the heat of battle. James remained calm despite some aggro to pull off an impressive win and Milan won a tough contest in true charismatic style. Will, Tom and Sam followed suit to make it another 5-0 win to the delight of the Northumbria faithful. Great effort lads. BU17 has traditionally been a strong age group for Northumbria for a number of years, and this year looks no different. Denise Thompson captained the team for Stage 1 and kept them fuelled with her now famous flapjacks. 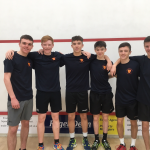 Nathan Dobson, Matthew and John Thompson, Sam Aiston, George Frewing and Kieran Mahoney joined forces to take on North Wales, Lancashire and Leicestershire. No games were dropped against Leicestershire and only England International Finlay Withington managed to beat Nathan against Lancashire. Denise was lining up the opponents in military style fashion and the boys were chopping them down one by one! 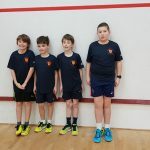 The toughest match was to come against North Wales but the lower order George, Sam and John wrapped up the win before Nathan and Matthew took to court. Two losses made it only a 3-2 victory but a place in the main finals was secured, an impressive performance by one of our strongest teams. It’s hard to believe sometimes that Andrew Shipley, Harry Little and Matthew Walsh are actually in the BU19 team, it seems only a short while ago that they were aspiring U13 players! 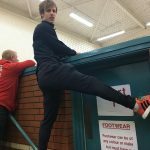 Similar to Sam Hamilton, Captain Dave Shipley has seen it all when it comes to county squash and the team couldn’t have been in safer hands. Only two teams two play after a last minute drop out, Cheshire and our neighbours Durham and Cleveland. Tom Cornell was picked to play Stage 1 but due to the drop out it didn’t make much sense him travelling down. A gruelling 3-2 win in end was crucial by Matty in the first match against Cheshire to add to an impressive win for Andrew against Amil Talib, Harry losing out 3-2. 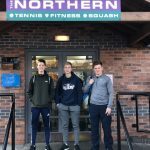 1st year Newcastle University student David Collins typically spoiled the party in Northumbria’s match against Durham and Cleveland notching a 3-2 win against Harry with Matthew finishing a 3-1 winner against Sam Gibbon. All down to Andrew, up against the ‘Duracell bunny’ Ben Cross. It’s late, pretty much everyone has left the club but the match still goes on, Andrew attacking and Ben retrieving. 2-1 down but on the charge a few dubious decisions don’t go Andrew’s way and Ben takes the win. So close lads, fine effort.